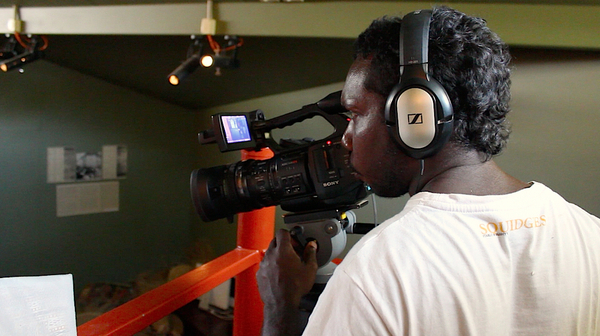 The Mulka Project is a digital library and production centre located in Yirrkala in north-east Arnhem Land. It exists as part of the community’s art centre Buku-Larrnggay Mulka Centre, facilitating the production of audio visual material and new-media artwork, along with repatriating valuable artwork, texts, images, sounds and videos of Yolngu culture that are stored in museums, art galleries, libraries and universities in Australia and around the world. For Shapes of Knowledge MUMA will present a cinema of works from the archive that highlight the collective and cross-generational qualities of The Mulka Project. The cinema will focus on the layering of content, time and authorship that is at the heart of the Project’s culture and approach. Following a visit by MUMA’s Director and Senior Curator to Yirrkala to establish a relationship with The Mulka Project and local practioners in the community, Mulka’s director and several artists will travel to MUMA during the exhibition to talk about the archive, its content and the possibilities of collective working. These talks will be open to the public, students, artists and cultural producers alike. ‘Mulka’, meaning a sacred but public ceremony and to hold or protect, was officially established in 2008 to sustain and protect Yolngu cultural knowledge and language in north-east Arnhem Land under the leadership of community members. The Project essentially exists as a physical site for the storage of the Yolgnu archives and a space for creation, training and sharing of culture within the community. Steering the organisation’s new-media focus are two principles: a process of experimentation and the sophisticated use of ‘discovered’ materials which are central to Yolngu art history and connect the past to the present and people to each other. The Mulka Project is currently Mundatjŋu Munuŋgurr, Gutiŋarra Yunupiŋu, Patrina Munuŋgurr, Yirrmal Marika, Arian Pearson, Ishmael Marika, Wukun Wanambi, Rebecca Charlesworth and Joseph Brady. The Mulka Project’s participation in Shapes of Knowledge was assisted by the Australian Government through the Australia Council, its arts funding and advisory body. The Mulka Project has been supported by the MUMA Contemporaries. Who's Afraid of Red, Yellow & Blue?